Author: Gabriele Sommer. Series edited by: Hans-Jürgen Sasse †, Rainer Voßen. This ethnography of language shift among the Yeyi people of Ngamiland, who are gradually giving up their language Siyeyi in favour of Setswana, Botswana’s national language, comprises three parts. Firstly, the relevant socioeconomic, sociocultural, and historical factors that triggered off and accompanied the language shift process among the Yeyi are dealt with. Secondly, the sociolinguistic situation within two Yeyi speech communities (Seronga and Shorobe) is described and analysed. Of primary interest in this regard are language attitudes, changes in speech behaviour, and patterns of language acquisition of both contact languages, Siyeyi and Setswana. Thirdly, the situation of individual (bilingual) speakers is taken into account which is determined by the historical developments and the governmental language policy. The latter favours the numerically dominant Tawana ethnic group and their language Setswana officially, in compliance with the ideology of vernacularization, not excluding assimilation processes of minority languages. 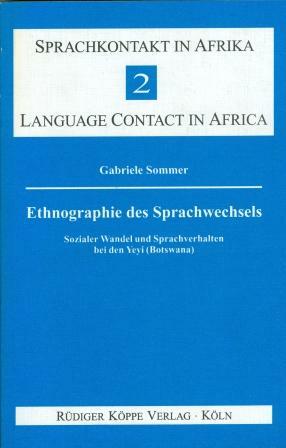 The work contains an extensive summary in English, exposing further the discussed contact-induced language change. [...] the volume can be highly recommended to students of anthropology or linguistics before they embark on their first own fieldwork. Helma Pasch in Language in Society, 278/1, 1998, pp.